Get your Silver Didrachm of Taras today for just £599 (FREE postage). Exclusive to The London Mint Office, we are proud to announce that you have the unique opportunity to own this genuine Silver Didrachm from Sparta's only colony, Taras. Without a class of slaves, and skilled craftsmen to provide for their daily needs, the children of Sparta decided to strike their own coins in Taras to trade with their neighbours. 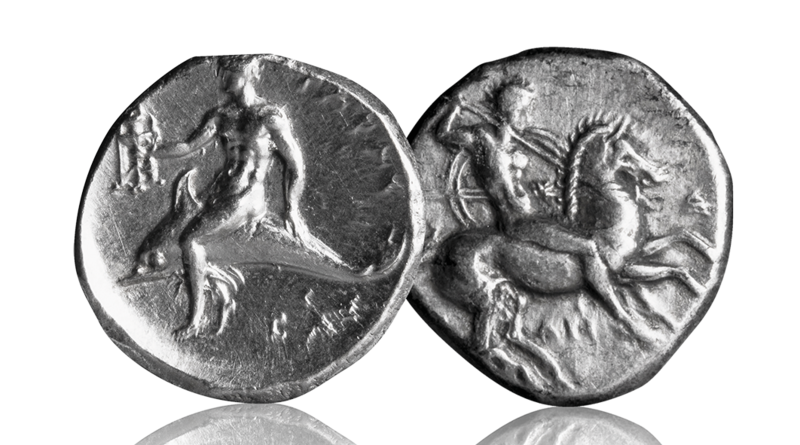 The image of a man riding a dolphin appears on most coinage from Taras struck from circa 425 BC. Some say he is Phalantus, the founder. However, he’s more likely to be Taras. According to Greek mythology he was rescued from a shipwreck by his father Poseidon who sent a dolphin to carry him safely to shore.